The Carnivorous Plant FAQ: Where do Venus flytraps (Dionaea) live? Q: Where do Venus flytraps (Dionaea) live? Dionaea A: This species is restricted in range to a small area in North Carolina and South Carolina. To my understanding, the colonies in South Carolina are nearly all gone. (Poaching events in the last year or so haven't helped.) The range of this plant is shrinking rapidly because of human activity, especially the construction of golf courses and vacation homes. 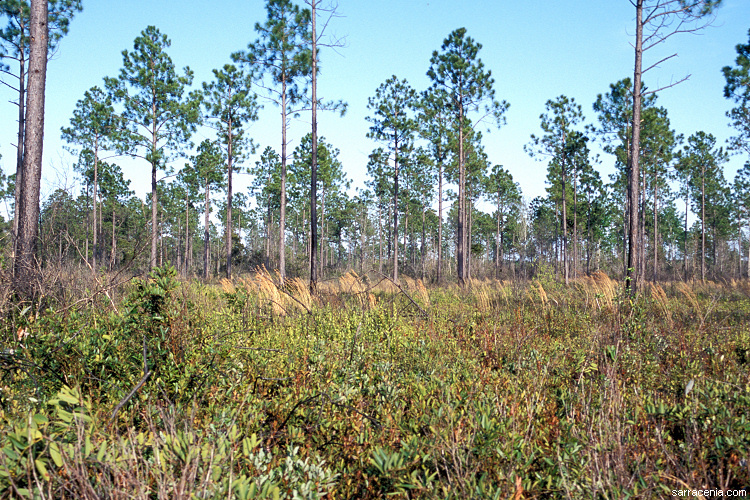 Recent surveys indicate there are fewer than 100 remaining sites for the plant in North Carolina and South Carolina. Thirty-seven sites were destroyed during the period of 1978-1993 alone! In North Carolina, the plant occurs in the following counties: Beaufort, Bladen , Brunswick, Carteret, Columbus, Craven, Cumberland, Duplin, Hoke, New Hanover, Onslow, Pender, and Sampson. Counties that it used to be found in, but hasn't been seen since 1979, are Jones, Lenoir, Moore, Pamlico, and Robeson. In South Carolina, it is found in Georgetown and Horry Counties. "The large populations of flytraps in the Florida panhandle are from seed scattered during the 1930s by old man Northrop of the defunct Insectivorous Botanical Gardens of Wilmington, North Carolina. I met him when I was in my teens and he was about 80 years old. At the time he grew most of the plants he sold on about 40 acres of land he owned in Wilmington. He apparently also bought flytraps removed from the wild, which at the time was a small cottage industry. His son Jimmy took over the business after he died in the 1970s. Jimmy died in the '90s and his daughter attempted to revive the business through tissue culture, but did not succeed. She was the one who told me her grandfather had scattered thousands of seed in Florida decades ago." I have also heard reports over the years of other attempts (and unfortunately in some cases, successes) at introducing them to Alabama, Arizona, California, Delaware, Florida, New Jersey, Pennsylvania, Virginia, and even Jamaica. Click on the map to see a closeup view of the historical native range. Information about seeing wild Venus flytraps can be read here. Page citations: Bailey, T.S. 2008; Bailey, T.S., and McPherson, S. 2012; Franklin, M.A., and Finnegan, J.T. 2004; Rice, B.A. 2006a; Russo, M.J. 1993; Schnell, D.E. 1976, 2002a; personal observation.